Imagine answering your doorbell from anywhere in your house, and beyond. This Ring Wi-Fi Video Doorbell allows you to do just that. 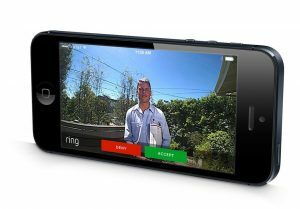 The Ring Video Doorbell allows you to see who’s knocking at your door via your smartphone. Tell them you’re not in and really mess with their heads. The doorbell has a HD camera built into it which gives a brilliantly clear picture even during the night. You can even connect the doorbell to your existing wiring or use the built in rechargeable battery that’s supplied with the unit. Now we have Z-wave and wi-fi enabled devices, and true to form the Ring doorbell uses motion triggered alerts which are sent to your phone via your wi-fi connection. 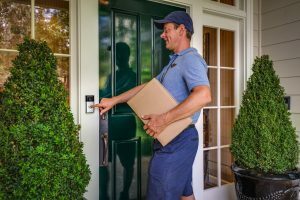 This lets you know anytime someone steps up to your doorstep. You can then decide whether to communicate with the visitor or unwanted guest at your choosing. Android and Apple devices are supported. So the Ring Video Doorbell is the first of it’s kind on the market- a wi-fi enabled HD doorbell that records and streams 2-way audio and video communications. The sensors work at a range of up to 30 feet and all the HD footage can be streamed straight to a cloud network, which you access with the Ring app. If you have a lot of security around your house and you use a video intercom, expect to see most of the new videocoms to hit the market to be wi-fi enabled. This clever device has certainly captured the imagination of home security enthusiasts. Now that the technology is available who wouldn’t want it? There is also a great lifetime protection warranty offered with this product. if anyone steals it, you will get a replacement free of charge. Plus if you have recorded straight to the cloud you might also get the culprit sent straight to jail. If someone is wise to the doorbell and figures out what it is, and decides to have a snoop around your house, once they are inside the 30ft sensor zone the motion activated sensor kicks in anyway and starts to record video straight away. That way you can catch out any potential criminals staking out your house, or who feel brazen enough to attempt a break in. This is a handy device if you happen to pop out or you are out for dinner and want to relay a message to a friend or relative who calls at your house. To ward off criminals it also provides an extra layer of security around your house, even if you are inside it. The Ring Wi-Fi Video Doorbell comes in a range of styles which will suit virtually any door color.